As we draw to the end of our first term in Salesian College of 2013-2014 we would like to update our parents of recent school events and upcoming activities which your may note in your diary. We congratulate Robert Clampett, Luke Murphy, Liam Hanley and Oublirayan Jayasamraj who have been chosen to take part in the Mathematics Olympiad which works with students who have achieved exceptional results in their Junior Certificate exams. These students will be given the opportunity to get involved in this programme which will offer many mathematical experiences, but will also offer enrichment classes at university level. We congratulate these students on their success. Congratulations to Adam Keogh, Cian Gowran, Matthew Finnegan and Jason Nangle who won prizes for their Art work in the Celbridge Credit Union Art Competition. We thank Fr.Alphonse, our new school Chaplain for his work so far this term with our students. Fr.Alphonse has met with all classes to explain his role and how he can support students in their own faith formation and in their academic and personal development. During term 2 and 3 we will interview all first year students to assess their progress and to continue to support their transition to secondary education. Fr.Alphonse will also organise an essay competition as part of our preparations to celebrate the feast day of Don Bosco, Friday 31st January. We thank all our parents and members of the community who volunteered and who assisted in the organisation of the Christmas fair in the school which took place on 14th&15th December. Funds raised will go towards the development of the ACRE project here in Celbridge. We thank all our students for their participation in the Non-uniform day on Friday 13th December. All funds raised will go towards aid relief in the Philippines following the recent hurricane devastation. We are presently introducing a new management information system. When fully operational this will greatly improve the effective management of all student information from results analysis to attendance and punctuality. We regret and apologise for the unanticipated delay in the issuing of the exam reports for Term 1. On behalf of all the school we would like to wish our new members, Fr. Koenraad, Fr. Richard, Fr. Alphonse and Fr. Gianfranco of the Salesian Community a warm and peaceful Christmas in their new home. The Salesian Community celebrate Christmas mass at 10.30am Christmas day and members of the community are welcome to attend. We thank all parents and guardians who completed the destination survey. We thank Dr.Kevin Byrne, Parents Nominee on the Board of Management on his excellent work in developing the survey and also giving of his time to work with the Transition Year students who assisted in the data input and analysis. The feedback from this survey will assist us in our future planning. We are presently processing our applications for a place in 1st year 2014-2015. Letters to successful candidates will be posted in the New Year. We look forward to welcoming to meeting our new students shortly afterwards. 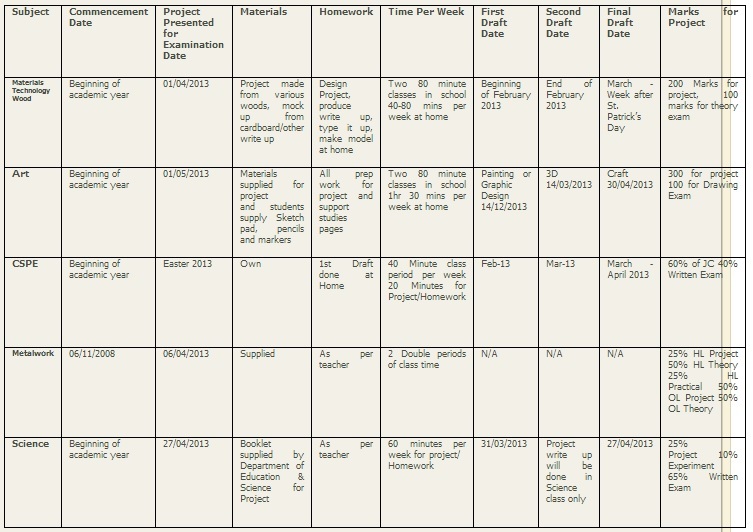 For all students completing project and portfolio work for their Junior and Leaving Certificate classes we have attached a timetable with information on the assessment percentage of the project work and the school deadlines for completion. We remind 6th year students and parents of the CAO deadlines. A comprehensive letter was given to all students reminding them of the key application dates and requirements to ensure their CAO application is processed completely. Over the last number of years the Career Guidance Department has organised professional interviews for our 6th year students. This has been done in collaboration with the Parents Association. We have been very fortunate over the last few years in the range of parents from different professional backgrounds and careers who give of their time to assist our 6th years in gaining invaluable interview practice and experience. The interviews will take place on Wednesday and Thursday 15th & 16th January 2014.We ask parents who have generously volunteered to make sure they check their emails for updates. All Junior and Leaving Certificate students should have a study plan organised for the Christmas holidays. 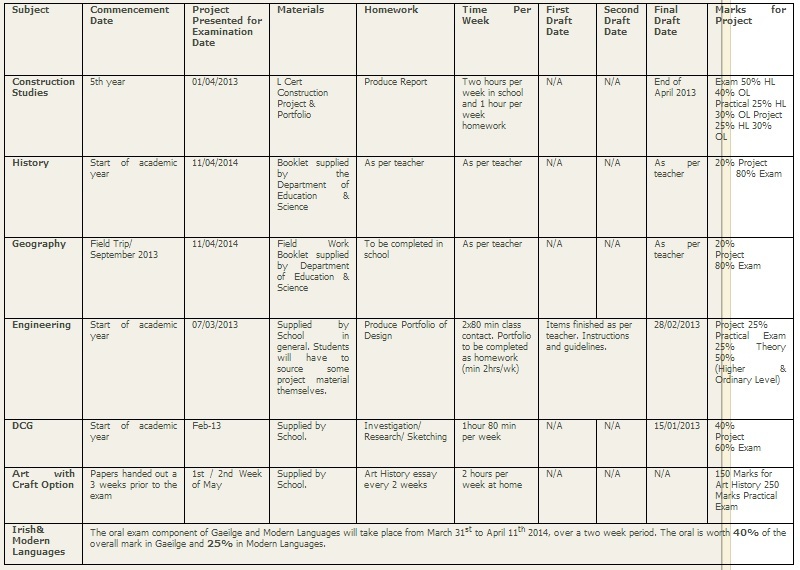 On their return in January there will be approximately four and a half weeks of class time before their mock exams. We strongly advise all our exam year students to form the good habit of focused and disciplined study. Application forms are available from Mr.Mc Evoy’s office for supervised afterschool study. These places fill up quickly so we advise our exam year students to make sure they have their forms in as soon as possible. Transition year students have had a very eventful first term and have been exposed to many learning experiences. Activities covered so far this year include the following, bowling in Palmerstown, visits to Castletown House, Croke Park, Dublin Zoo and Collins Barracks, French/German film, French Theatre for Schools, Road Safety course, Wassa Wassa- Art Attack module. Students completed a full day in cookery skills in Fairyhouse Cookery School and TY1 have had ongoing tuition in Horticulture in the Acre Project. TY2 students will travel to Dublin on Thursday 19th to participate in Carol singing in aid of Don Bosco House, which provides residential care and support to young people. 41 students are registered for the Gaisce Bronze medal award and are busy learning a new skill, involved in a sport of their choice and participating in their community as part of the requirements for achieving this award. They will also hike in the Wicklow mountains later in the year. ECDL modules will shortly be completed by TY1 and students in TY2 will start this programme in January. We wish to thank all employers who facilitated our students in their two week work placements. Their support is very much appreciated and time spent monitoring, giving feedback to our students adds to the hugely positive and enriching experience that the students have. We wish all of our TY students and their parents a Happy Christmas and look forward to seeing you all in January. On bhfoireann ar fad guímís Nollaig faoi shéan ‘s faoi mhaise agaibh go léir. We wish all our students, teachers, staff, parents and guardians a peaceful and happy Christmas.